For February’s painting project, I’ve chosen a photo that’s been the foundation of quite a few of my recent paintings. 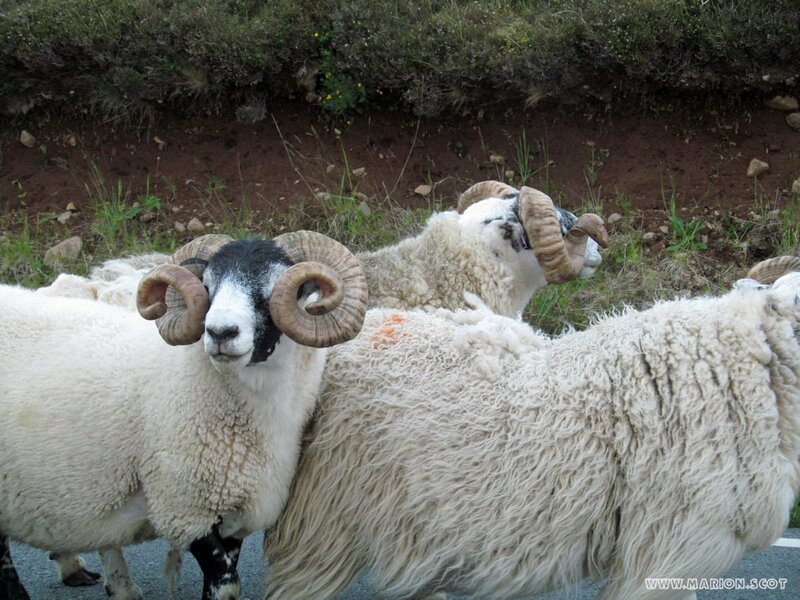 It’s part of a squence of photos I took one evening when local crofters were running a large group of rams with magnificent horns down the road. 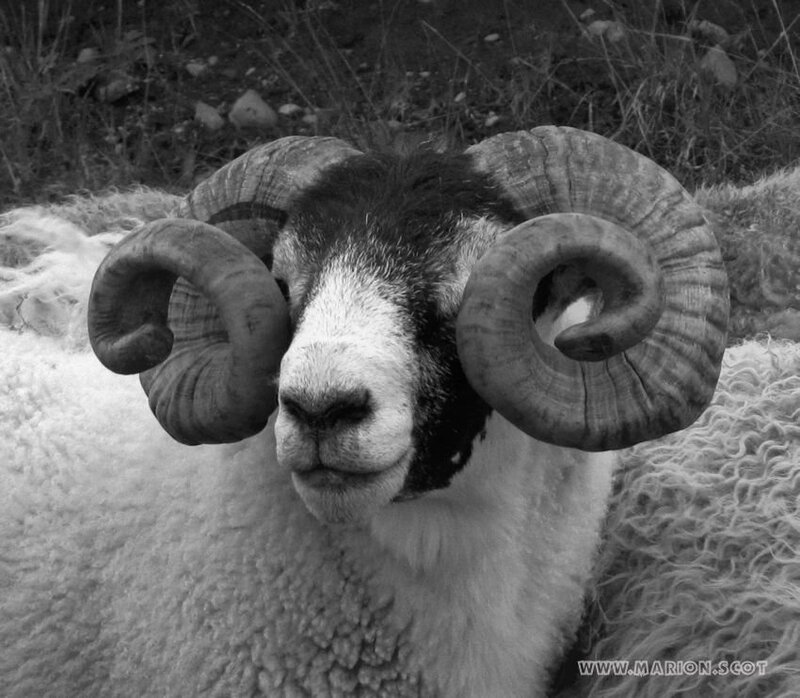 The photo is intended to be a starting point, deliberately chosen to encourage you to focus on the ram and its magnificent horns, with the context cropped off. It’s intended to open the question of composition, to possibilities, rather than being a photo that presents you with a perfect composition, lighting, etc. Will it be more of a portrait, or will you put in the body and a suggestion of location? What about against an area of solid colour? Make a note of your first thoughts or impulses, then push the ideas a bit further with thumbnails to see it leads. 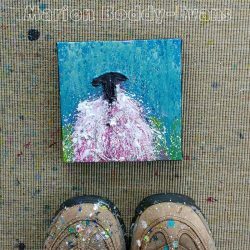 The style, medium, and size of painting are up to you. Click on the photo to get the largest version of it or go here. Here’s a closer-up view, in black and white to make the tones clearer. 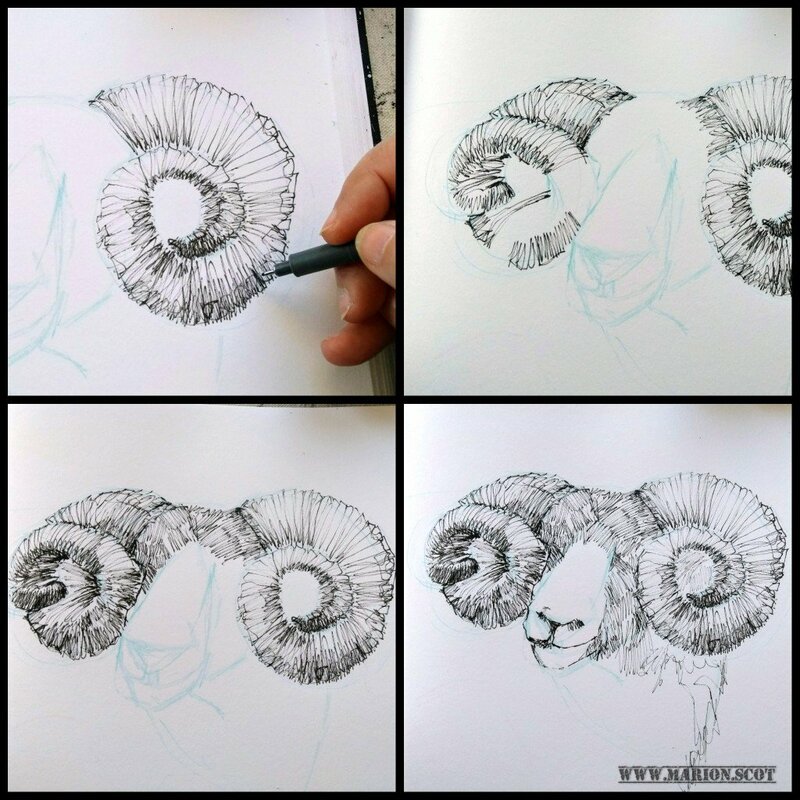 In the past few weeks I’ve done a version using a black fineliner pen and several painted versions, using a rigger brush for the horns. 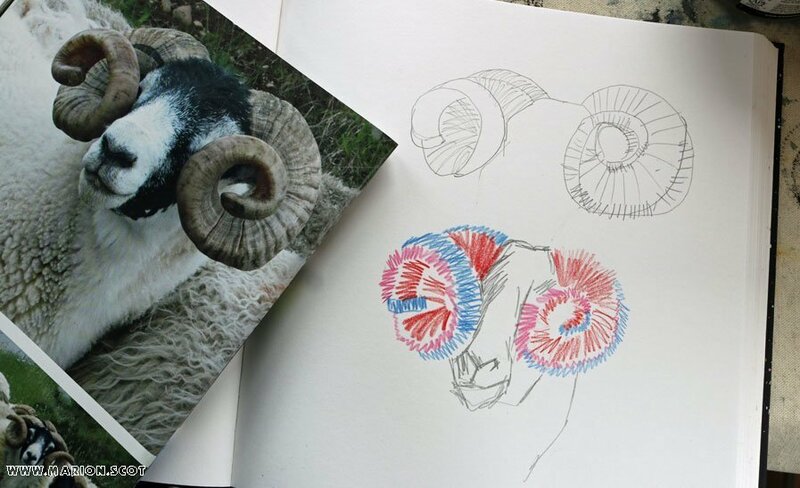 My starting point was spending some time looking at the twist in the horns, to understand what I’m seeing, tracking the curve of different edges/sides of the horns, using pencil and then coloured pencil. That I subsequently simplified the horns in my paintings was a stylistic choice. It’s a photo I’ve also included in one of my photo reference booklets, which is what you see lying next to my sketchbook. Of course there’s no reason why your painting should have one ram only. The photo is a starting point, intended to jump-start ideas. 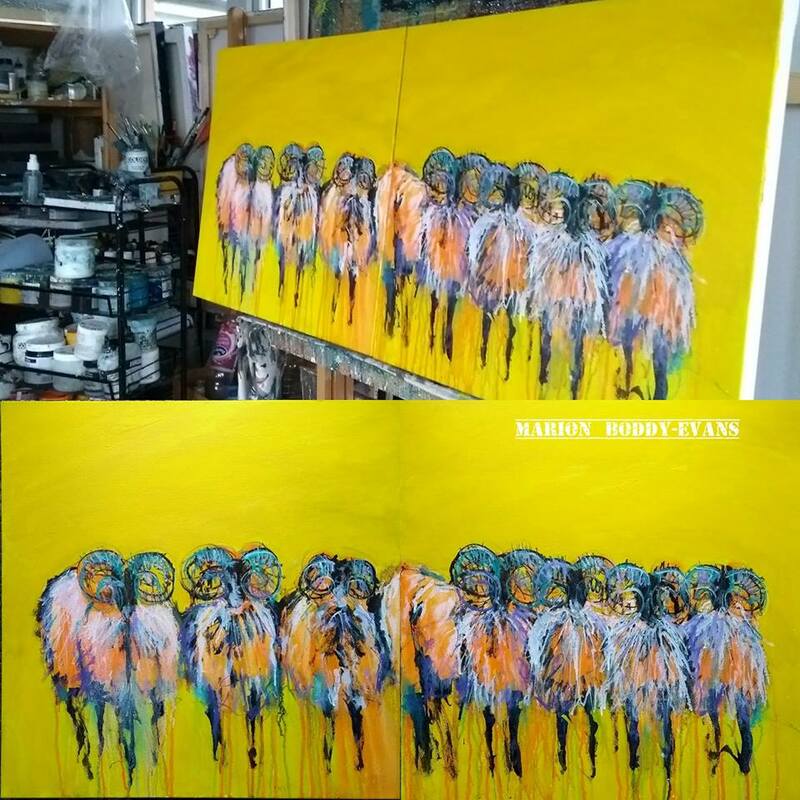 for inclusion in a photo gallery at the end of the month, ideally with a few sentences about it (think: things you might say when talking to a friend about the painting). I’ll post photos with first names only, unless you ask me otherwise. Seeing what different people have done from the starting point is interesting, intriguing and inspiring. You can become a Project Patron and view the exclusive project content when it’s published here. It also includes the option of a short critique of your painting if you wish.